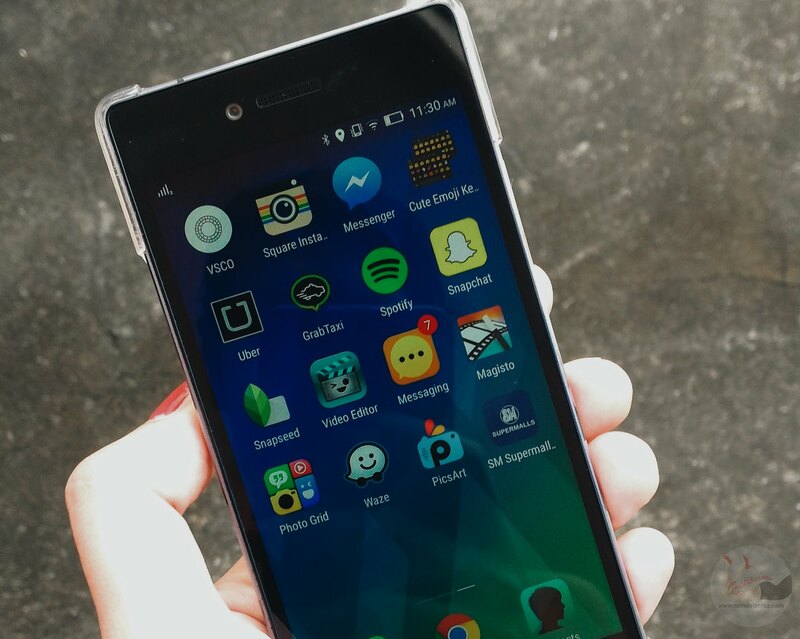 In this digital age and mobile lifestyle, businesses are reaching customers and staying connected with them via Mobile Apps. One of my favorite malls (well, I love all the malls!) SM Supermalls recently introduced the SM Mobile App where shoppers can easily find stores, locate your parking slot, check cinema schedule and collect deals and rewards for a more fun shopping experience wherever you are. Being the curious me (and a shopper), I downloaded the SM Mobile App. One can link his/her Facebook or Twitter app to register but it would still ask you to register with valid email address. Upon successful registration, I was presented with this! I played around with the app and checked the schedule at the SM Mall nearest to me. I can even buy tickets via the SM Mobile App (it requires another log in information). 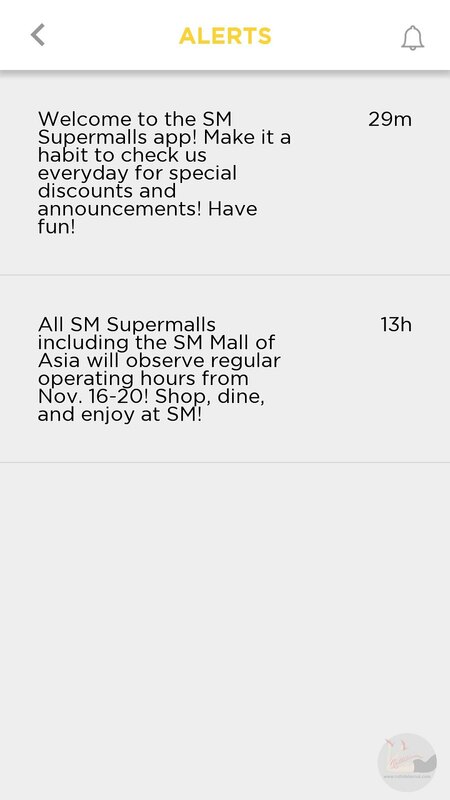 I quickly checked out the Alerts Icon and of course, there's a Welcome Note and Traffic Advisory (updating shoppers about the latest in SM Mall of Asia - especially after the APEC Summit) - i like it! The SM Mobile App lists all the SM Malls in the Philippines and with my Location On, it shows the nearest mall to my location (and how many kilometers away). Wow, I never I am much nearer SM Valenzuela than SM Megamall! Checking out the mall nearest to my place, I got to explore the services available and businesses and restaurants locations. I was surprised to see there is a Philpost service in SM San Lazaro! I always frequent the mall for quick errands but I never realized there is a Philpost Office in the mall! 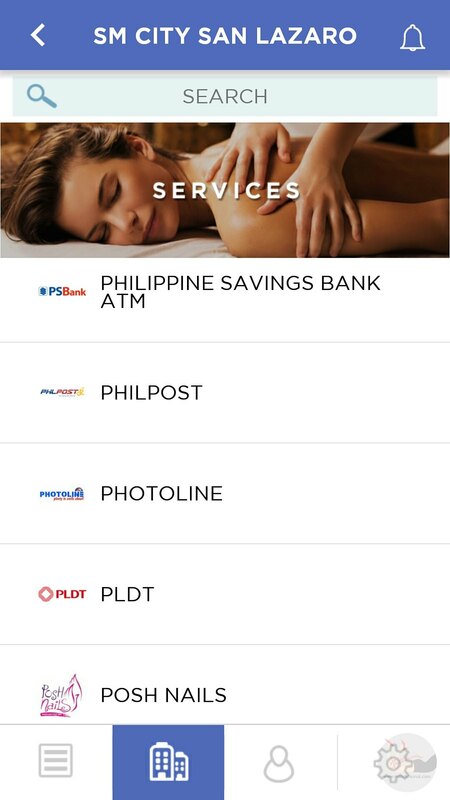 The SM Mobile App shows stores and their current promos. I liked some of them so it would be automattically added in my Profile. Just to remind me to check them out once I am in the area. Under Profile, there's a Coupon section and lookie! I already got a reward! 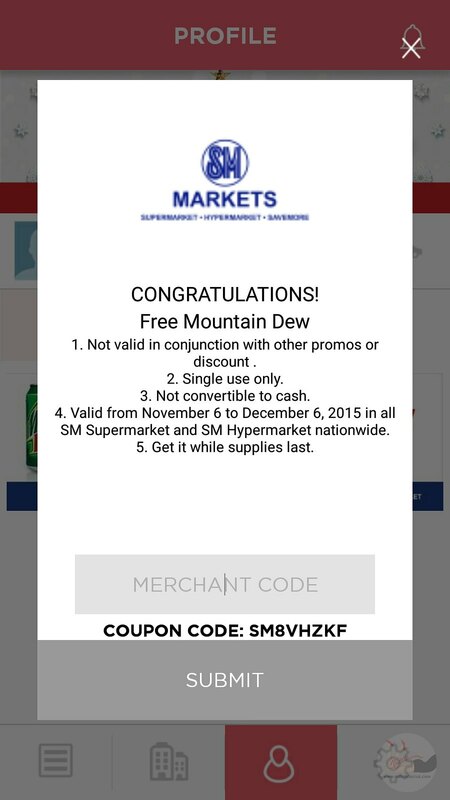 Free Mountain Dew for Php 500 purchase at SM Supermarket. I could wish it was a Free Mug Rootbeer! But it is a freebie, and I am not complaining. I would claim this on my next trip to the grocery. 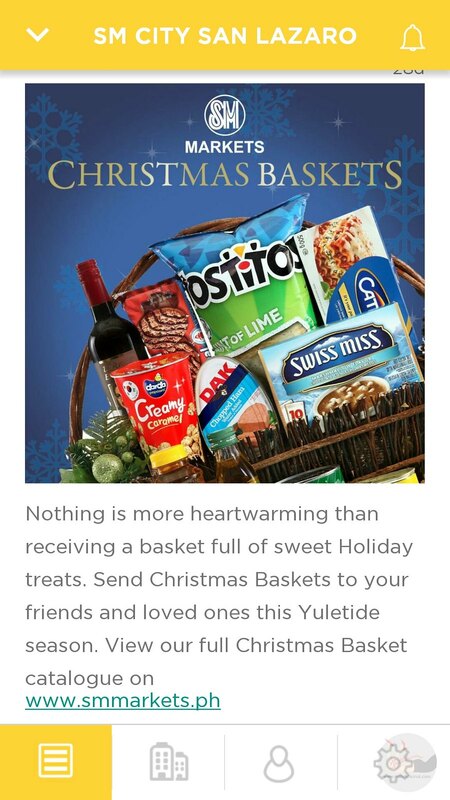 Speaking of SM Supermarket, SM also offers gift baskets perfect for Holiday Gifting. I love that the details in the SM Mobile App also contains the direct link to the website - same is true for other businesses, restaurants and stores. 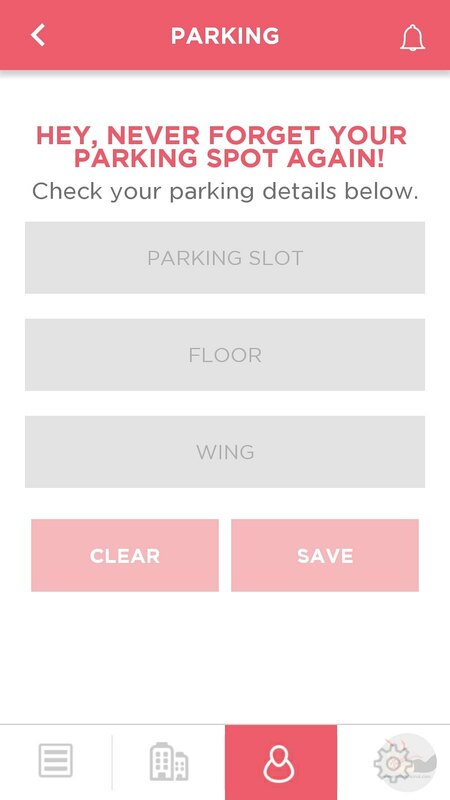 Plus, the app even allows you to save your Parking Slot so you won't get loss in the Parking Universe! It is easy to download, get register and navigate. It shows the nearest SM Malls based on your location! Perfect if you want to waste time before going home or letting traffic jam pass. Instant rewards and deals upon registration. It shows list of stores and exact location of the restaurants, businesses and merchants. You get alert notifications on sale events, traffic advisory, etc. 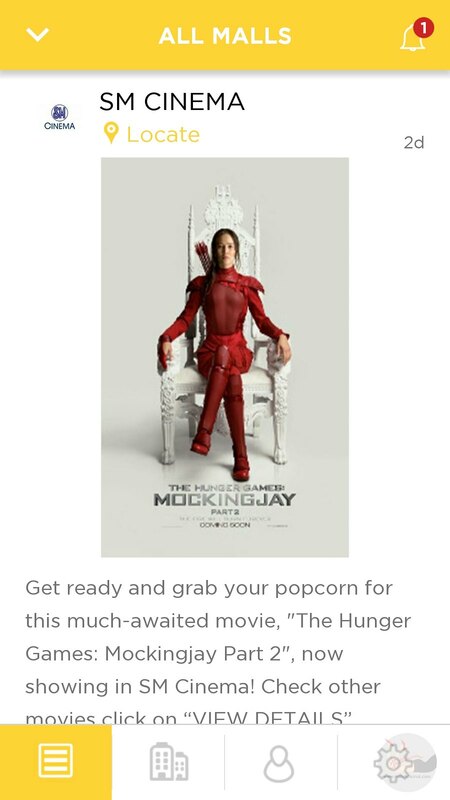 Easiest way to check movie schedule and buy tickets! Save your favorite deals and discounts for easy tracking! I can discover new restaurants in the SM Mall I am in! Download SM Mobile App now in Google Play or Apple App Store. 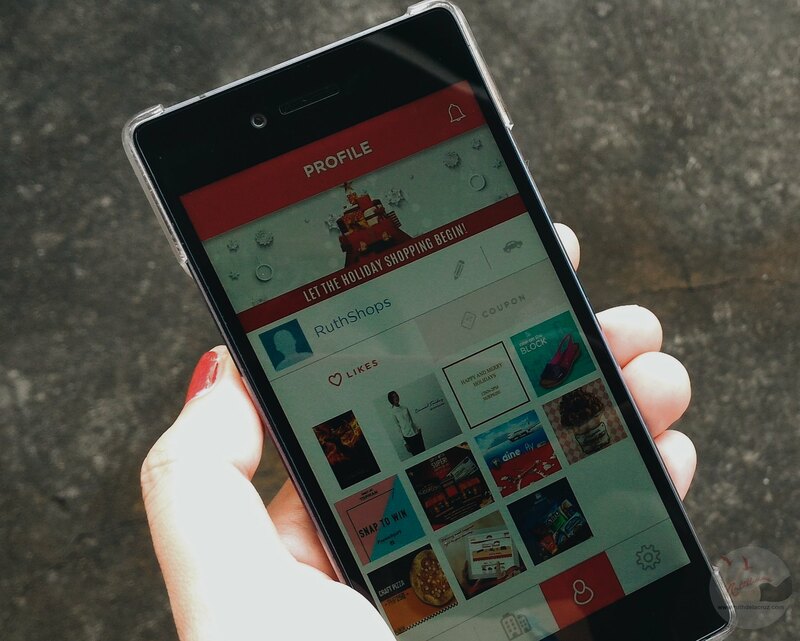 Have you tried using the SM Mobile App?